By registering you may receive occasional information about my upcoming events. I will not share your information with anyone, and you may opt out at any time. for humanity and will change forever how well you live your life. Her journey will captivate you as she discovers the simple key to living true to her unique divine design. Whether you are looking for more meaning in your work, more passion in your life, more fulfillment in your relationships, or the courage to be who you are, Violet will show you the way. Violet's Vision poignantly connects body, mind and spirit. The author has created a character who shares the innermost fears, desires and needs of each of us. The artwork is fabulous. The book itself is a concrete expression that includes beauty, truth, nostalgia, nurture and love. I can't wait to read it with my grandchildren! Order a print of "Little Mother's Angel"
Violet's Vision is a message of inspiration that is both delightful and thought provoking to read. Living true to our essence is something within us, and while I conscientiously make an effort to remain true, this book really helped remind me and inspire me. I highly recommend this book to anyone who aspires to liberate their personal power and manifest their highest visions. This is a wonderful story of an angel who rediscovers the meaning of her existence by helping others see their own. The beautiful drawings by the author's grandchildren enhance the message that the writing so simply delivers. This is a great book to have as a reminder to persist with your own vision --- and when you want to snuggle up with your wee loved one and share an inspiring tale for them to live by. 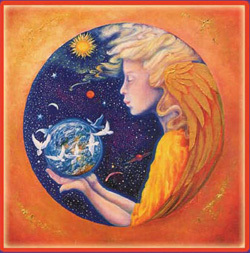 Violet's Vision is an excellent message for connecting to your own personal life purpose. People of any age -- children and adults will be blessed by reading this book. Author Fran Fisher is an excellent author and life coach. 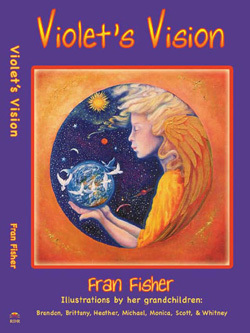 The words of the Violet's Vision are inspiring and the illustrations by Fran's grandchildren are beautiful. A great way to carry on the legacy. If you are looking for a book to bring a child or friend out of a place of low activity and feeling defeated or to inspire them by giving them a gentle nudge and offering them a real and simple strategy to move on, this is it. Violet's story engages the reader in her dilemma and you are caught up immediately in how she will discover her way to solving it. Easy to read, a great bedtime story for any age (adults too). You'll want to read it more than once. "I feel that if we keep trying to be our vision, we can make our vision happen."